An FM-index is created by first taking the Burrows-Wheeler transform (BWT) of the input text. 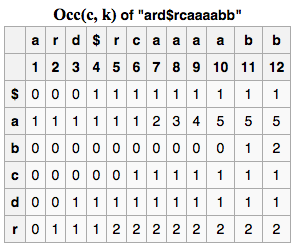 For example, the BWT of the string T = “abracadabra” is “ard$rcaaaabb”, and here it is represented by the matrix M where each row is a rotation of the text that has been sorted. The transform corresponds to the last column labeled L.
C[c] is a table that, for each character c in the alphabet, contains the number of occurrences of lexically smaller characters in the text. 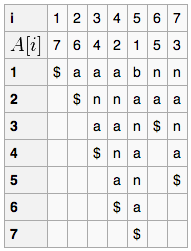 suffix array definition: X[0:n] with a '$' character spliced in the range of [0,n]. C(a)	  # Where char's start. compression at the cost of slightly greater cpu time. row index of a BWT character. character of the same row index).